Here at Printmet, we pride ourselves on the quality and technical precision of our work, which has been rewarded with the loyal custom of many industrial operators over the years. We work carefully with designers and planning teams, using technical drawings to achieve a highly specific and tailored result. If required, we are also able to produce product prototypes and samples, in order to achieve the greatest level of precision and customer satisfaction with each project. 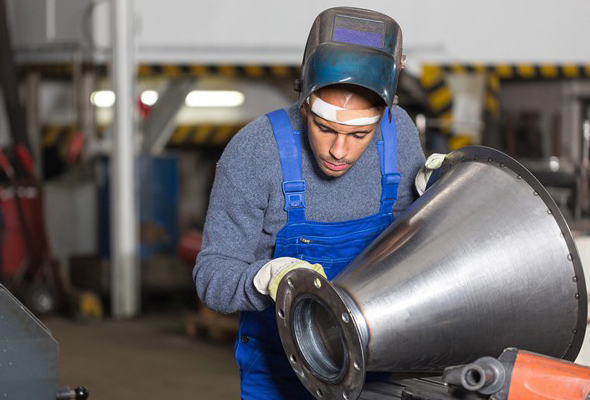 In addition to our work with manufacturing and production firms, we have also provided sheet metal engineering services to numerous clients within the construction industry. This has involved working closely with architects and builders, to ensure that each of the functional and aesthetic requirements are being properly met. During this process, we will carefully examine customer drawings and liaise with the customer, to secure the highest level of accuracy before commencing the metal engineering process. During our 60 years of operation within the industry, we have accumulated a wealth of knowledge and experience, which extends far beyond our own field of fabrication and sheet metal engineering. Thanks to our extensive work with a variety organisations, both large and small, we are able to approach each new commission with an enhanced understanding of client concerns and demands, for an unbeatable level of efficiency. While the construction of highly specific and precise designs may seem like a tightly controlled and rigid operation, we understand and value the need for flexibility throughout the creative process. During each project, we make it our priority to mould our services to fit the demands and expectations of our clients, to ensure that each product is delivered with a personal touch. In order to provide the quality and precision needed for each of our sheet metal engineering projects, we ensure that communications between ourselves, the client, and other project collaborators, are upheld for maximum coherence. This allows each aspect of the design, construction and installation process to run smoothly, while instilling confidence in our ability to deliver highly accurate results. Along with our knowledge and expertise, we are also able to provide quality craftsmanship, producing metal solutions that are beautifully finished and built to last! This is achieved by using the most advanced machinery and production techniques throughout each stage of the process, from cutting and forming to surface finishing and welding. A skilled, knowledgeable and proficient team, who specialise in every area of sheet metal engineering and fabrication. Here at Printmet, we take great pride in our ability to provide a fantastic selection of engineering services to clients of all sizes, thanks to our range of equipment, and the abilities of our skilled workforce. Before commencing each request, we will carefully assess the demands of the project, in order to match the work with staff members whose skills and knowledge are best suited to the application. On-site inspection for a completely personal service, which fully responds to the demands of your conditions. We understand the importance of taking a hands-on approach to the planning and execution of our projects, which is of particular importance when working alongside other professionals. For this reason, we regularly conduct site visits during our engineering projects, in order to closely assess the requirements of the client, whilst also responding to any challenges or limitations present. Absolute precision and attention to detail, for even the most complex and elaborate designs. Using our range of capabilities, we are able to produce an almost unlimited array of products and components for clients in a wide variety of sectors, ranging from health and environmental services to catering and agriculture. Once we are provided with the measurements and instructions required to execute your design, we will then use our specialist equipment to create an object which carefully reproduces the specified details.